Being a nice, clean, ready to move into 1.5 story home with porch attached. Offering on the main floor, a 13'x14' carpeted living room. 13'xlO.5 bedroom, 13'6"x 10' eat-in kitchen with nice oak top & bottom cabinetry, stainless steel sink,tile design vinyl floor, 16'6"x9' carpeted sunroom with access onto the 14'6"x16' wood deck (this area also contains a 6' high chain link fenced area for pets), 9'x8'6" carpeted laundry room with access to basement, and a 10'x7'9" full bath which has 58" shower and ceramic tile floor. Upstairs contains 12'x9'6" bonus room with closet, 13'x9' bedroom with double closet and pocket doors. The front covered wood porch measures approx 18'x9'6". Home is equipped with 200 AMP breaker box, LENNOX fuel oil furance, city water and sewer, 4 window AC, a lot of replacement windows. Home is situated on Parcel#110701019000, lot size 66x66, taxes $157.38 year. 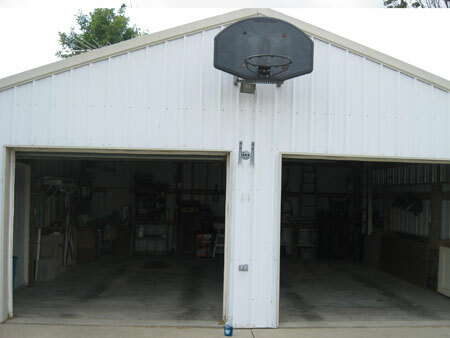 According to Auditor, garage built in 1994 with double overhead drive-in doors with openers and concrete floor. CLEAN 2004 Buick Century, silver, 4 door, 3100 SFI, 6 cylinder, A/C, showing 106,876 miles, cloth, power seats, power windows, split bench front seat, VIN# 2G4WS521741236233, tilt wheel, AM/FM CD/Radio. Appliances: FRIDGIDAIRE Gallery Frost Proof 18.4 cuFt. White refrigerator/freezer; white Estate WHIRLPOOL 4-burner electric range; SHARP Carousel 1200 with microwave, 34" MITSUBISHI color television, SAMSUNG stackable front-load washer and dryer, 23,000 BTU DYNA-GLO kerosine heater, LG flat screen 42" television, television stand, KENMORE humidifier, GEORGE FOREMAN grilling machine, coffee maker, toaster, BISSEL upright sweeper, 6 gal. Shop vas. Set of Pfaltzgraff rose pattern china including plates, cups, bowls; found dinette with 4 chairs and 2 leaves; 5 shelf pine open bookcases, 2 really nice upholstered rocker/recliner; really nice tan micro-suiede love seat with recliner; 2 oak end tables; queen size matching pillow top box spring and mattress; dresser and matching night stand; 4 drawer chest of drawers; solid cherry double door wardrobe; plank bottom modern rocker; nice clean matching full size pillow top box springs and mattress; white 4 drawer chest of drawers; 7" digital photo frame; SKYCADDY range finder (golf); dominos; poker chips; cassette hand-held recorder; JENNY CRAIG scales; AM/FM CD/Radio; binoculars; NINTENDO game cube. Circular saw; extension cords; pipe wrenches; c-clamps; gas powered weed eater; TORO blower; DELTA table saw; electric 1800 PSI new-in-box pressure washer; fiberglass 8ft WERNER stepladder; aluminum 6ft stepladder; 24 ft aluminum extension ladder; set of Goldern Bear 460 golf clubs with irons and case; set of King Cobra speed LD golf clubs; Hard case shipping for clubs; 18 and 24 boxes of Titleist golf balls; pull behind golf bag/cart. Real Estate Terms: Min. 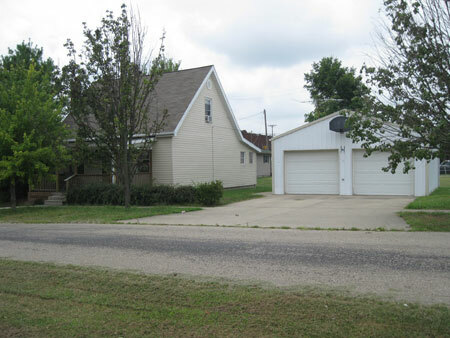 Bid $32.666.66; $3,000 down at time of sale; offered free & clear with balance on delivery of deed; closing on/before Oct. 4, 2010; sold in AS-IS conditions: no buyers contingencies exist. Personal Property Terms: Cash or check; positive ID; everything sold AS-IS. All sales final! Taxes & Legal: Thomas M. Spetnagle, Attorney at Law. (740) 774-2142.